“The reason this study is so interesting is because it’s so unusual,” said Harvard University’s Brigitte Madrian, co-director of the household finance working group for the National Bureau of Economic Research. “There aren’t a lot of other scientific studies one can point to” that show empirically that financial education can improve an individual’s well-being, she said. Skimmyhorn eliminated a problem that is common when testing the impact of financial education. By measuring the course’s ability to improve an individual’s actual behavior such as saving and debt reduction, he wasn’t relying on tests for financial “knowledge,” which is a squishy thing to measure. The course, which the Army implemented nationwide six years ago, is part of every new enlistees’ advanced training, typically after they complete basic training and begin their advanced training. It is offered on bases around the country, from Fort Huachuca in Arizona to Fort Eustis in Virginia. Among Skimmyhorn’s sample of 86,000 people who took the course a year earlier, he found that they were more likely to save and to save more – twice as much as those who had not taken it. Each class participant’s average contribution to the Thrift Savings Plan, the federal equivalent of a 401(k), increased by about $17, to $32 per month. This may not sound like much, but it adds up to an additional $4,000 each, on average, for retirement – and much more for big savers. Skimmyhorn also found that the larger savings persisted in the second year of the study. Financial boot camp also reduced enlisted personnel’s debt levels a year later by about 10 percent for car loans and for auto loans. Together these results – more saving and less debt – indicate that class participants were not merely reducing their debt payments so they could put more in their savings account. 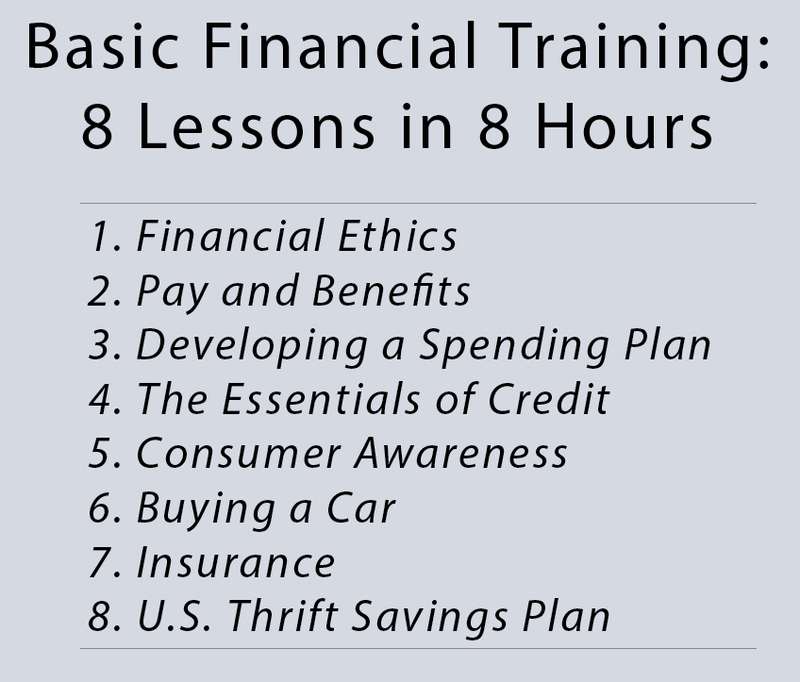 The Army’s financial course also is a natural experiment that eliminates something called “selection bias,” which occurs when the people who are most interested in working on their finances voluntarily sign up for financial education or counseling – rather than others who may need the help more. If a program mainly attracts the most diligent, it’s difficult to know whether it can work on the broader population. Skimmyhorn said readers are welcome to email him here for a copy of the paper, which he has submitted for publication. If you like this article, consider sharing it on your Facebook page! Thank you for doing such an exceptional study. San Diego City College proudly conceived and then taught this financial management program on behalf of the Army and, importantly, the sponsors of the program, Army Emergency Relief (AER). In partnership with AER, we wrote the curriculum and then taught this course for more than nine years. We knew it made a great difference in the lives of soldiers and their families. On behalf of our dedicated faculty and staff, thank you for your in-depth, data-driven study.